For those who haven’t yet heard, Pam Long Photography has moved to Main Street in Historic Ellicott City! This is such exciting news, and we want to be sure everyone is able to easily find us at our new location. Details about DIRECTIONS and PARKING are below. When you finish parking, feel free to call us in the studio at (410) 988.5563, and we will come to help you with any bags (leaving you free to carry your baby, for example) and an umbrella if it’s raining. First things first: directions to Pam Long Photography (our address is 8202 Main Street, Ellicott City, MD)! (On the maps you can click-and-drag, zoom, and change the map mode to get a better view.) Click on “View larger map” below each map to go directly to the Google Maps page. From various areas of Ellicott City (such as College Road, Old Columbia Pike, Route 40/Rogers Avenue, and Frederick Road), feel free to go to this page, fill in your beginning location, and get directions right to our door! 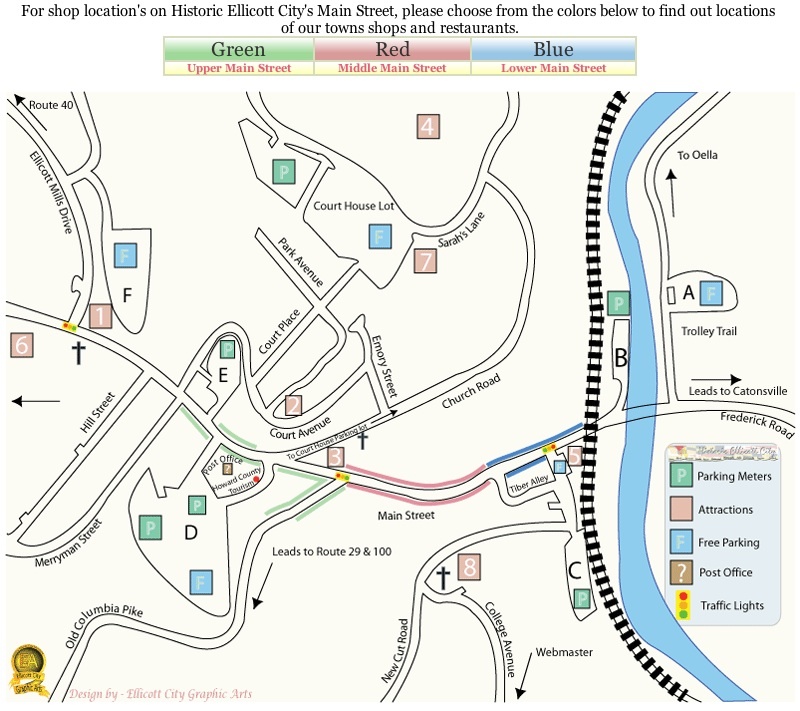 Next we have parking in Historic Ellicott City! Of course, parking on the side of the road on Main Street is an option. As for parking lots, there are several places by Main Street; here are the lots that are most convenient to use when arriving at Pam Long Photography. Lot D, which is split into both pay and free areas, is located behind the post office. The pay areas are located nearest Main Street and are 25 cents per hour — everywhere else in the lot is free. Lot E is located behind the Ellicott Mills Brewery Restaurant & Pub, this lot is parking metered and charges 25 cents per hour. Lot C is a little farther away, perfect for nice days to park and take a nice quick walk up Main Street. This lot is free for parking. The parking lot near Tiber Alley is at the bottom of Main Street by the railroad — in fact, it’s right on the way to Main Street from Lot C (it’s not listed on the website map as a letter, but it’s near the beige number 5 on the lower right corner of the map). Parking is free here. Lot B is located just past the lower end of Main Street, between the railway bridge and the Patapsco River. This lot has parking meters that run 50 cents an hour. And those are just the lots that are closest to Pam Long Photography! There are five other lots, all of which can be found on the website link at the beginning of the above list (or here).